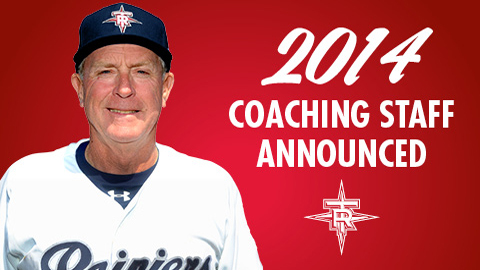 TACOMA, Wash. -- The Tacoma Rainiers today announced the coaching staff for the club's upcoming 2014 season, with Rich Donnelly set to become the 29th manager in Tacoma franchise history. Jaime Navarro will join Donnelly as the Rainiers pitching coach and Cory Snyder will take over hitting coach duties. Donnelly, 67, is a veteran of 43 years in professional baseball and carries an 836-753 (.526) record through 13 seasons as a minor league manager. He enters his first year in the Mariners organization after managing the past three seasons (2011-13) in the New York Mets farm system for Single-A Brooklyn. His 128 wins with the Cyclones rank as the second-most in the franchise's history. The Steubenville, OH native began his managerial career in the Texas Rangers farm system, serving as skipper with seven different clubs over 10 seasons. He was selected as the Western Carolinas League Manager of the Year three consecutive seasons while managing at Single-A Greenville (1972), Gastonia (1973-74) and Anderson (1975). Donnelly previously managed in the Pacific Coast League at Sacramento (1976) and Tucson (1977-79), posting a 279-290 record in the PCL. His other managerial stints include stops at Triple-A Wichita (1981) and Denver (1982) of the American Association. Donnelly carries 27 seasons of Major League coaching experience with four different teams, most recently as the third base coach with the Los Angeles Dodgers (2006-07). He also served as the third base coach with Milwaukee (2003-05), and he coached for 14 years under Jim Leyland with the Pirates, Marlins and Rockies (1986-99). Donnelly was signed by Minnesota as a catcher in 1967 and played four seasons in the minor leagues with the Twins (1968-69) and Washington Senators (1970-71). Navarro, 45, returns to Tacoma after spending the past three seasons as the Major League bullpen coach with Seattle. He previously served as the pitching coach for the PCL Championship-winning Rainiers team in 2010. His 2014 campaign will mark Navarro's seventh season in the Mariners organization since making his coaching debut with Single-A Wisconsin in 2008. Navarro put together a 17-year professional career as a right-handed pitcher after being drafted by Milwaukee in the 1987 draft. He made a combined 361 Major League appearances with the Brewers (1989-94, 2000), Cubs (1996-96), White Sox (1997-99) and Indians (2000). Snyder, 51, joins Tacoma's field staff following three consecutive seasons as the hitting coach at Double-A Jackson. Prior to joining the Mariners organization in 2011, he spent four seasons managing in the independent Golden League from 2007-10. Snyder's playing career includes nine years in the Majors with the Indians (1986-90), White Sox (1991), Blue Jays (1991), Giants (1992) and Dodgers (1993-94). Rounding out the rest of the Rainiers staff are Athletic Trainers Tom Newberg and B.J. Downie and Performance Coach Gabe Bourland. Newberg's 2014 campaign will be his 28th as a trainer in the Mariners organization and eighth with the Rainiers, and Downie's second consecutive season in Tacoma will mark his seventh in the Mariners organization. The 2014 season is Bourland's first at the Triple-A level after spending the past three seasons with the Peoria Rookie Mariners. Opening Day for the Rainiers 2014 season is scheduled for 7:05 p.m. on Thursday, April 3 when the club opens up a four-game series against the Albuquerque Isotopes. To purchase season tickets, group packages or party decks for the 2014 season, call (253) 752-7707 or email tickets@tacomarainiers.com. Up-to-date news and notes leading up to the start of the 2014 season can be found at www.tacomarainiers.com and by following the Rainiers on Twitter (@RainiersLand) or liking the team on Facebook.